Branding is very important for business these days with more and more people investing in their logos, the design of their business and what they portray to the general public at large. Very few people know, however, how to protect that branding and prevent others from using it. If you have a small business this may not be important but as your business grows and becomes larger issues such as branding and the protection of that branding becomes more and more of a concern. In addition, you may have come up with a certain way of processing something i.e. goods, or you may have come up with an invention or in fact created a website that you wish to protect and prevent others from copying in the future. All of these matters are covered by intellectual property law and this is intended as a brief Guide summarising what options are available to you to protect a brand, an idea or a concept and how to go about protecting such matters. Trademarks cover protecting goods and services so that they can be distinguished from others. These include logos, pictures, words and a combination of these. By registering a Trademark you then have the right to use that Trademark under the class in which it was registered. It is important to note this because there are a number of difference classes – 45 to be exact – and these range from food and drink to medical services, education, building construction, chemicals etc. A Trademark an only be protected in the class in which it was registered so, for example, if you registered a name and logo of ‘Cobra Construction’ under the building services class but did not register it against, say, the food and drink class there would be nothing to stop someone else from then registering the same Trademark under that class. They could then create, for example, Cobra Construction Lemonade. You can, however, register a Trademark under multiple classes and there is a fee payable for each. Distinctive for your goods and services i.e. different to what is already out there and registered. Not the same or similar to any earlier Trademarks on the register for the same or similar goods or services. The Intellectual Property Office also have the right to object to any words, logos or pictures which are unlikely to be seen as a Trademark by the public. This includes, for example, marks that describe the goods or services e.g. marks to show quality, purpose, quantity etc. They can also object on the grounds that the terms in the Trademark have become customary in your line of trade i.e. technical terms that are commonly used, or if they are not distinctive enough. Provided the Intellectual Property Office have no objections then the procedure is to fill in an online application which can be found on the IPO’s website and pay a fee of £170 and then an extra £50 per class under which you want to register the Trademark. If you do not register your Trademark you still have rights under Common Law it is just that a registered Trademark is much easier to enforce if somebody tries to copy it for the same business/area. A registered Trademark will last 10 years so it needs to be renewed at the end of the 10 year period. The process of registering a Trademark normally takes around six months. A Copyright is a right which relates to the expression of an idea but not the idea itself. For example, it covers matters such as sound recordings (music), films, broadcasts, books etc. It also covers photographs, websites, computer programmes etc. The idea behind a Copyright covering the expression and not the idea is that, for example, if you create a website you can protect the content of that website i.e. the specific words and pictures, but you cannot protect the process in which you design that website. It is important to note that Copyright is an automatic right so you do not need to formally apply for or pay for it. It arises as soon as the work becomes fixed so, for example, as soon as the photograph is taken or the time the book is written. You would then automatically become the owner of it but you could date a copy of the work and then deposit it for safekeeping with a Solicitor or a Bank. That would establish beyond doubt when you created that work. As the owner of the Copyright you can then licence it or sell it to another party. People who use your copyrighted item with your permission can do so in return for royalties. Copyrights last for the duration of the lifetime of the person who created it plus 70 years in respect of literary, musical, artistic or dramatic works. For films it is 70 years after the death of the last of the Directors, Score Composers, Dialogue or Screenplay Authors and for television and radio programmes it is 50 years from the first broadcast. The same applies for sound recordings/music. 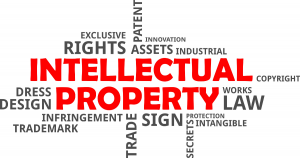 A Patent is a means of protecting a process or a product that is new or inventive. The idea is to protect the invention by making it unlawful for anyone apart from you or someone with your permission to produce, use, import or sell it i.e. you would have exclusive right in the country where the Patent has been granted as long as you keep renewing that Patent. Patents tend to be territorial which means that if you register one then it is only valid in the area in which you register it. For example, if you register a Patent in the UK then you would only have rights in the United Kingdom. If you then wanted to protect it elsewhere you would have to register separate Patents in those territories. Scientific or mathematical discovery, theory or method. A method of medical treatment or diagnosis. A Patent specification is prepared where you write down a written description and drawings of the invention and set out the technical information with regard to what the invention actually does. You complete Form 1 which can be obtained from the Government’s website. This is then filed with the Intellectual Property Office. You pay a £60 fee to lodge this form. Within 12 months of the filing date you then have to file a Form 9A which asks the IPO to carry out a search and this costs £150. You have to lodge the fee at the same time. The IPO carry out a preliminary examination to ensure that the Application meets with their formal requirements. They normally do this within one month of receiving the Form 1 and fee. After they have received Form 9A and the fees they will then search for inventions similar to yours within four months and they will send you a Report detailing the documents that they have found. They will then publish the Patent Application eighteen months after the date that you file it and this publication will include all correspondence between you and the IPO. It is available for public inspection. You then have to file a Form 10 together with a further fee six months from the date that the IPO publish the Patent Application. That form asks the IPO to carry out a substantive examination and the fee is £100. If the IPO feels that any changes are needed they will notify you and then provided that your Application meets all of the requirements of the Patents Act 1977 they will grant your Patent and publish it. They will also provide you with a Grant Certificate confirming registration of that Patent. Designs are primarily concerned with the physical appearance of an item or part of it. It is focused on appearance rather than how the item works. This includes such matters as the colours, the shape, texture, materials etc. You can register protection for a design which initially lasts five years but then can be renewed every five years up to twenty five years. The Intellectual Property Office have a Design Registry and there is a fee payable. The design right would then prevent others in the UK from copying the design. Please note that this is not a complete right because it only covers the 3D aspects of the item and does not protect the surface decoration of a product or any 2D pattern i.e. wallpaper or carpet design. If you wish to protect an item, brand or invention and require our assistance please do not hesitate to contact us on 01654 711499/01341 281108 or email abright@alwenajonesbright.co.uk. Special thanks for assistance with the research for this article goes to Delyth Mai Williams of Coleg Meirion Dwyfor who runs the excellent Design and Technology course, her assistance her assistance was invaluable to helping us publish this article.